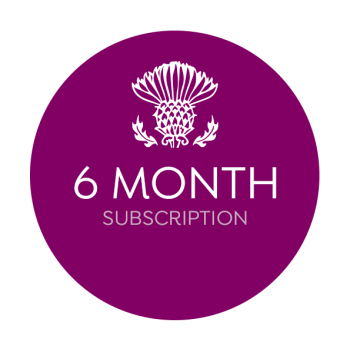 The 3 month subscription is a BRAW way to bring Scotland a little closer! Order today and you are in perfect time for the MAY ‘The Gathering’ WeeBox as featured in British Vogue! Click here to let yer lad or lassie know you’ve given them the gift of glorious Scotland! Note: Your May WeeBox should arrive on your shores towards the end of May, unfortunately we cannot guarantee a delivery date. If a gift, we recommend printing the above card. WeeBox is delivered straight to your door every month, hand wrapped in current local Scottish newspaper so you can even take a wee peek at the headlines. Each box is sourced to connect you with Scotland and what might be happening that month on our bonny shores – helping you to feel proud and get involved.